Heavy equipment operators fall under the skilled labour category that you might often hear people name drop. Heavy equipment operators undergo training, and must be intimately familiar with a wide range of different machinery (often incredibly expensive and complex machinery) that is vital to large construction and building projects. 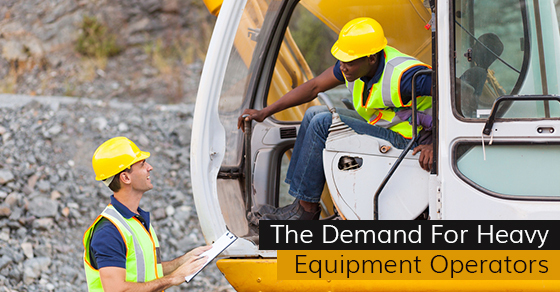 The short answer to the question: “Are heavy equipment operators in demand?” is yes, they are. In British Columbia, for instance, it is expected that the province is going to need roughly 7,000 heavy equipment operators in the next 5-6 years. This is to help complete large infrastructure and building projects throughout the province that are going to be needed as time goes on. These people need to be reliable, competent, and knowledgeable with a wide range of common heavy machinery that are used on construction and building sites. Many of these jobs will be on sites that are dedicated to building natural gas pipelines throughout the province and heavy equipment financing will be an essential part of making sure they are completed on time. The expertise and experience required to handle and use heavy equipment is specialized and therefore something that companies and the government is willing to pay for. It is not only a wise career move in terms of job security (as these skills can be used all over Canada, North America and the world), but they are often quite well paid, especially once you have some experience under your belt. These jobs are also in high demand because they come with some safety and danger considerations. They are often jobs that are needed far from human civilization, and require you to operate heavy machinery in difficult weather conditions, at night, early morning and work long hours in order to complete high stakes and necessary projects throughout the country. When gas and electrical lines are involved, the work is quite tough and requires precision and a steady hand in order to make sure that your safety and that of the people around you is never in question. One of the most important questions to ask yourself when thinking about how in demand certain jobs are, especially if you are thinking about heavy equipment financing to get started, is where those jobs are in demand. What the economy in one province demands is not necessarily going to be what the economy in another demands. B.C. and Alberta may have higher demands than Quebec and Ontario. It also pays to think about what the licensing and educational requirements are based on the province or region you want to work in. If you are thinking about becoming a heavy equipment operator, and require heavy equipment financing to get started, it is a good idea to think about how in demand your profession is going to be, and where it is going to be in demand. But, based on the construction and skilled labour requirements throughout much of Canada in the coming years, heavy equipment operation is going to be in demand.